They somehow won the game anyway! The Cleveland Cavaliers are mired in their annual drama-filled regular season; whether or not they recover in time for the playoffs as they have the past few seasons remains to be seen. Wednesday night, we got to see the Cavs’ problems illustrated in one hilarious sequence of events. It’s tough to say what the best part of the video is. Isaiah Thomas popping a contested, off-the-dribble 3 with 14 seconds on the shot clock? That a Cavs possession late in a tie game with an Eastern Conference playoff rival saw LeBron’s involvement consist of halfheartedly setting a two-man screen before walking back up the court? That Thomas’s aforementioned shot sailed straight into the backboard? 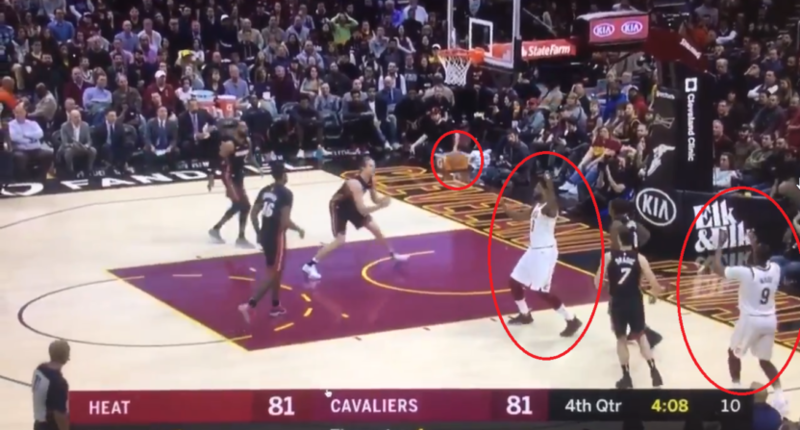 That Tristan Thompson was the only Cav playing hard at all, following the shot and tipping the carom straight to a wide open Dwyane Wade, who promptly passed up a wide open shot to throw a late pass to Thompson, who’d already turned away? The Cavs ended up pulling out the game, 91-89, but their problems are real, and even LeBron might not be enough to carry them through the playoffs this time around.